Since deciding to rent out several 9′ Designs In Wood farm tables for events and such, we have already booked two events for this summer! This is a previous farm table that Devin created for a client very similar to the ones we will be offering to rent. 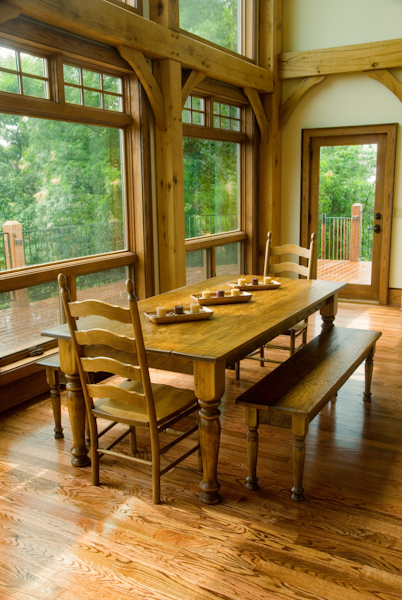 Each 9′ Pine Farm table will accommodate 10 people. They can also be used to accentuate the food and beverage areas or gift tables at your wedding or event. Rentals of these tables are $100 per table and delivery is $100 for up to 6 tables to locations within the High Country. If you would like to reserve one or several for your event, call or email me for availability. Chair rental options we really like are available at Classic Party Rentals or at A&J Rental. Boone Rent All also has the standard white folding chairs available. Next Post First wedding of the season! !